My kids are growing up quickly! Many of them are approaching the pre-teen stage. 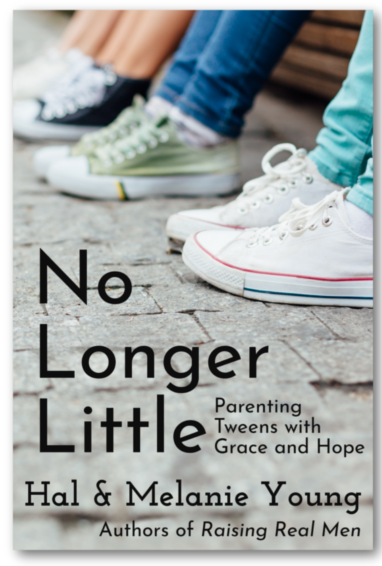 So, when given the opportunity to review No Longer Little: Parenting Tweens with Grace and Hope from Great Waters Press, I eagerly awaited the book. This book is written by Hal and Melanie Young, authors who I already know and enjoy. I love how they offer practical insight combined with biblical wisdom. What’s the Premise of the Book? Teenagers are the age group that most parents dread raising. But, the trouble with teens starts long before they’ve finished puberty. And if you don’t help your children navigate through the difficult pre-teen years, you might have a rougher path ahead of you. Chock full of useful information on navigating the hormones and personality changes of the tween years, No Longer Little is a book that offers encouragement and wisdom for parents. Woven into the book are personal stories from the Young family, which offers a real-life perspective. No Longer Little walks with parents through many of the changes they’ll experience in their children as they grow. It talks about the hormones and body changes that begin before the official puberty stage. Emotions are covered in depth, as well as some practical ideas for how to handle the roller coaster emotions. School and memory are covered. Many children at this age have a hard time remembering things. Their minds are shifting, as they prepare to understand the more complex abstract learning topics of late middle school and beyond, and this means their brains are busy. They don’t have as much space in there right now to keep track of everything like they used to. There’s a great chapter on spiritual questioning, and how to help your children transition to owning their own faith instead of just believing what you believe. Awkwardness, family relationships, and work are also covered, along with many additional topics. I read through this book, and am slowly beginning to implement some of the ideas. It’s helped me remember the importance of grace when dealing with some of the changes my kids are going through. Growing up is tough, and while there definitely need to be rules in place, it’s important to remember what’s age appropriate for kids in this age group. I plan to reread the book as each of my kids approaches pre-teen age. Each chapter offers a refreshing blend of information, wisdom, examples, and scripture. It’s easy to read, but not a quick read – there’s a lot in there to unpack and think about. I really appreciate the humor and grace the Youngs tackle this subject with. They’ve raised many children through this stage, which means they’re speaking from experience. If you’re wondering why your eight, nine, or ten year old child is suddenly acting completely differently, I’d encourage you to read this book. It’ll help you look at things a little differently, and help you navigate these years with your kids. To see what other review families had to say about No Longer Little: Parenting Tweens with Grace and Hope, or another new book from Great Waters Press, Love, Honor, and Virtue: Gaining or Regaining a Biblical Attitude Toward Sexuality please click on the banner below.